As soon as I saw the title of this book I said.. yep me! 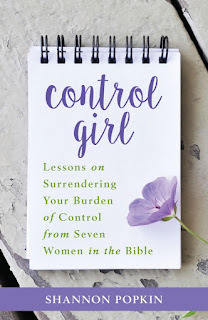 What woman doesn't feel like they struggle for control rather than letting God just be in control? I think it is a common theme for us. I love how Shannon took women from the Bible as examples for us to learn from. God wrote this book for our application, and we can learn so much from the issues that they struggled with. Rest.. I long for true rest and to get that, I need to give up control. Shannon takes a look at the following women; Eve, Sarah, Hagar, Rebekah, Leah, Rachel, and Miriam. Then the final chapter is on how to go from a control girl to a Jesus girl. LOVE! Three to Five lessons in each chapter, this would be an excellent group study, as well as individually. I would love to share this with my young adults group as I think it is practical for any age woman. Very well written and organized!